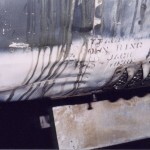 921’s windshields and canopy had deteriorated beyond salvage. Because there are no replacements available, I decided to have new bird resistant polycarbonate panels made. I turned to L.P. Aero Plastics to do the job. We worked closely together for a LONG period of time to make sure we got it right the first time. 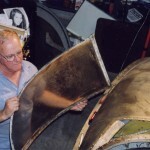 We realized the original shields were too weak and wanted to increase the thickness for added protection. 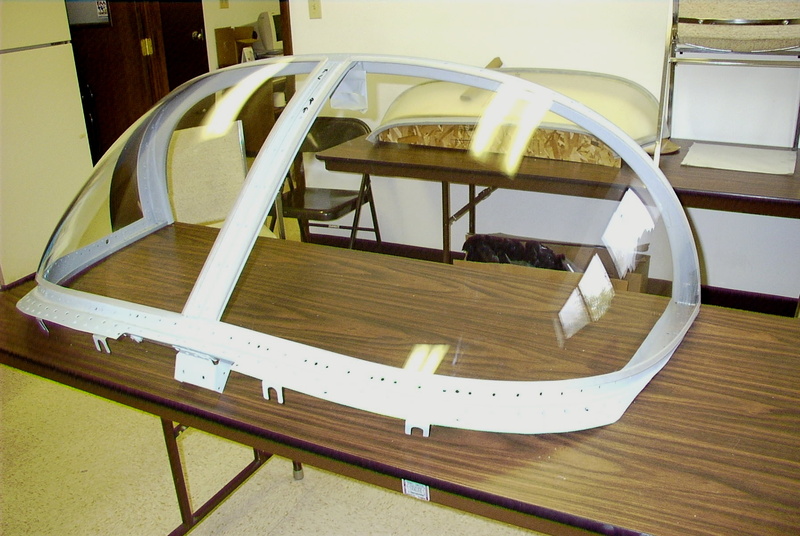 This would cause MAJOR problems because it would change the alignment of the canopy height relative to the surrounding sheet metal of the fuselage. And the original way in which the glass was installed could not be realistically reproduced. Besides, I don’t feel it was a very good installation anyway. So a plan was drawn up and given to LP Aero. 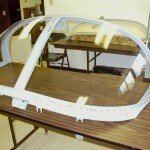 The entire canopy and windshield frame was boxed up and sent to them as a form. I designed a routed inside edge to the windshields; 1/4″ outside lip, 1/4″ inset of frame. This would force modifications to interior components. But it would work if we were careful. We were careful. 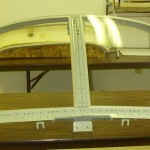 The new completed windshields are optically perfect and fit correctly. They can be replaced more easily than the originals. Note: The glass panels themselves are NOT drilled. Included are close-ups of the canopy mods we made with the assorted pieces. They include, from inside to out: spacer, gasket retainer, strips of gasket material, Teflon tape, the canopy glass, Teflon tape, gasket material,glass retainer strips of aluminum, an edge guide of 1/4″ x 1/2″ aluminum bar stock. Then final cover by the fairing. All match drilled. The bar stock was difficult to fabricate as it followed the compound curve of the canopy frame, had to stay FLAT on frame, and was match drilled to the canopy and countersunk. This sounds easy, but was fraught with misalignment issues. 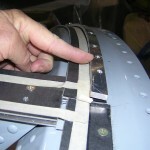 The barstock had to be torqued into position to its final set position AND exact height before it could be drilled 90 degrees from the canopy frame. (The height issue must be consider because the spacing of bolt holes at the frame is different on the bar stock. 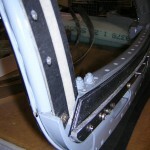 The bar stock holes that sits 3/16″ outside the of the frame are further apart. Consider it is following a slightly larger circumference of a circle). A canopy jig would have made the difference, but needless to say one is not available. When the bar stock issue was finally completed, we made another set in case another aircraft needed to be modified with new panels. The complete canopy was loosely assembled and put into an outside storage container that heated up during the day in the hot sun (temp would rise to 150 degrees inside!). When the box was warm, we tightened the screws down to slowly pull the glass into its final resting place without stress. The canopy baked for two weeks as we alternately loosened then tightened the holding screws. There appears to be no excess stress points on the glass and is allowed to “float”. In any restoration, there comes a specific item in the process that holds a particular special place in your heart and memory. The canopy and windshield are these “special places” for me as I was told that there were no replacements and the system could not be duplicated. Having not done this type of restoration before, it gave me pause to consider the incredible work done by others who do this for a living. I’m proud of our final result and don’t mind sharing it. 921, after being abandoned for over 30 years, acquired an assortment of dings, dents, stolen equipment, and other assorted insults. But it was complete, airframe wise, and with its old engines in place. It was boxed up a second time and sent via ship to the US and its new home to be refurbished, restored, rebuilt, to new standards. Every system, component, hose, hardware, cylinder, seal, was removed and made new again. 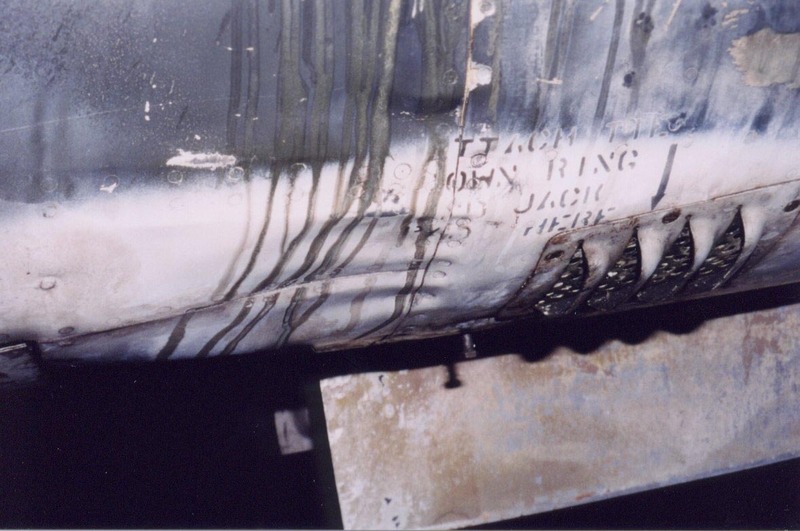 Every hydraulic cylinder was found to be corroded beyond airworthiness, so new ones were fabricated, including shafts, wipers, O rings. 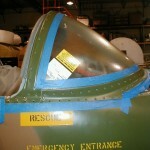 Metal sheeting was replaced on the fuselage and tail where damage had occured. All controls, originally magnesium, were replaced with aluminum, then painted and re-balanced. 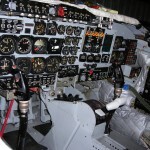 The panel was kept as original as possible, all instruments overhauled. All wiring was either replaced, removed, or re-tested to ensure proper functionality. The explosive devises in the aircraft, the ejection seat charges and the canopy explosive shell, were removed for safety purposes. The jettison capability for its armament was removed and all underwing pylons were made to be fixed in place once attached. 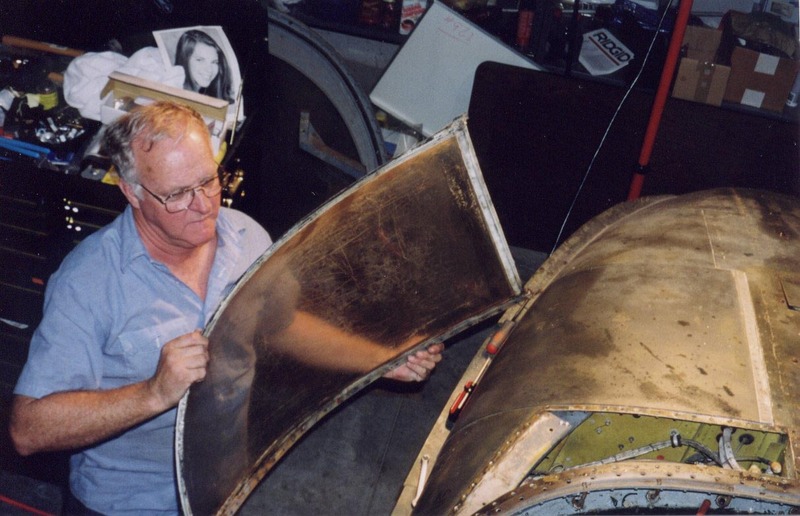 External fuel tanks can be removed by conventional means by putting a holding cradle underneath the tank and activating the internal manual release lever in the pylon. The engines were replaced with two new overhauled J85-17A engines, zero timed, with all new or overhauled accessories. Capable of 2,850 pounds of static thrust each–5,700 lbs total, the A37B has no problem pushing an empty weight of 5,572 lbs. 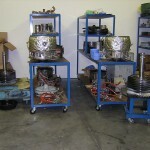 The starters were overhauled and have proven to be more than capable of spinning up the little General Electric fuel burners.